Last July, thousands took to the streets across the U.K., chanting "shame on May" following reports that an official visit by Trump was in the making. WASHINGTON — President Donald Trump will travel to the United Kingdom in July for his first official visit since taking office, following months of speculation that both sides were avoiding a visit over concerns that he would be met with mass protests. White House Press Secretary Sarah Huckabee Sanders announced the trip to a briefing room full of children in honor of "take your child to work day." The working visit with British Prime Minister Theresa May is scheduled for July 13, Sanders said. Downing Street confirmed the visit shortly after in a statement: "He will hold bilateral talks with the Prime Minister during his visit. Further details will be set out in due course." Last July, thousands took to the streets from Manchester to Cardiff, and even outside Downing Street in London, chanting "shame on May" following reports that an official visit by Trump was in the making. Over one million people also signed a petition boycotting a visit by the American president. 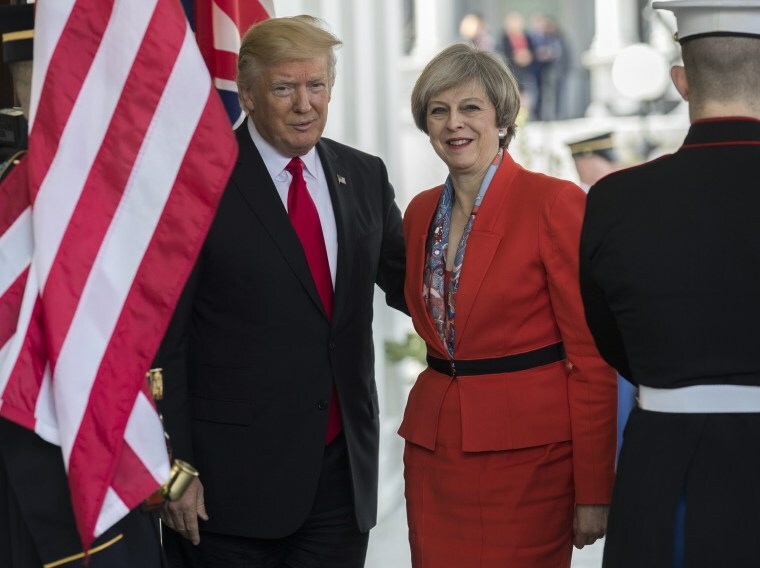 May was the first foreign leader to visit Trump at the White House just weeks after his inauguration. Trump, an outspoken supporter of Britain's exit from the European Union, has not warmed to May the way he has to President Emmanuel Macron of France, who visited the White House this week for the first official state visit under the Trump administration. May has expressed her concerns over destabilizing actions by the Russian government and has urged Trump to take a tougher stance on Moscow. She is a staunch opponent of Trump's rebuke of the Iran nuclear deal and her government was stunned by Trump's proposed steel and aluminum tariffs and has since been pressing for a permanent exemption. Trump has also engaged in a war of words with London Mayor Sadiq Khan, who in May 2016 became the first Muslim to be elected mayor of a major Western capital. After his election, Khan tweeted criticism of then-candidate Trump’s rhetoric, saying his "ignorant view of Islam could make both our countries less safe. It risks alienating mainstream Muslims." Trump later challenged Khan to an IQ test during an interview on ITV and has since accused the mayor of lax counterterrorism and immigration policies. Trump's attacks on Khan prompted May to call out his accusations as "wrong." But officials say the relationship has improved in recent months as the longtime allies find areas for cooperation amid shifting policies. Last month, the Trump administration joined European Union nations, Canada and Ukraine, expelling 60 Russian diplomats and closing the consulate in Seattle, in response to Russia's alleged use of a nerve agent to poison a former Russian spy living in the United Kingdom. The White House described the move as being one "in solidarity with its closest ally, the United Kingdom."